The prettiest 10-12" candle ring....Aurora Pine is one of our best selling lines with very full icy glittered pine branches. 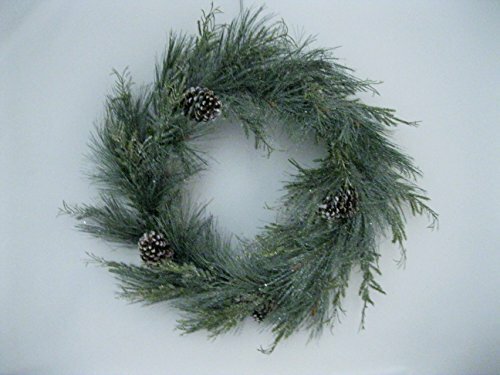 Two types of glittered green pine are silver glittered with two types of snow-tipped natural looking pinecones. 6.5" center ring will accommodate pillar We convinced our supplier to bring Aurora candle rings back after selling out every year we were able to get them. You will be pleased with the quality and design. .6.5" center ring will accommodate pillar candles, hurricanes, bowls, etc. Zucker Feather Products ZUCKER Schlappen-Peacock Feather Christmas Wreath - Kelly/Natural - 24"
XLarge Black Feather Wreath...Fluffy Black Halloween Wreath - Gorgeous ! Queens of Christmas BAT-BWR-16-GO-PW Gold Ball Christmas Wreath with Battery Powered Pure White LED, 16"